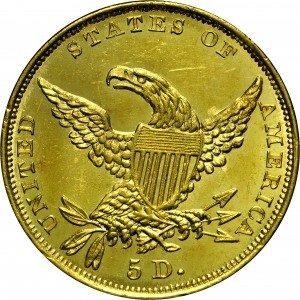 William Kneass prepared this half eagle design and similar quarter eagles. Except for the hair treatment, they are slightly different. Otherwise they are identical designs. The obverse is patterned after Classic Head half cents and large cents created years earlier by John Reich. Kneass’ reverse is a copy of the previous half eagle reverse without the motto above the eagle. 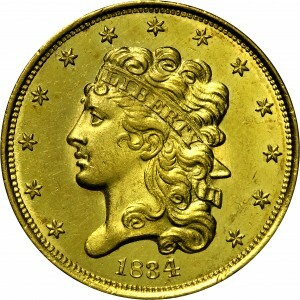 This First Head type has a large head close to the stars above and distant from the date. Although not included here, one common die variety has the digit 4 triple-cut. From Stack's sale of the Gaston DiBello Collection, May 1970, Lot 836. Miss Liberty faces left, her curled hair tied by a band inscribed LIBERTY. Around, 13 stars are evenly spaced with the date below. Branch mint 1838 issues have the mintmark immediately above the date. Small plain 4 in date. "1(b)/A(b). Obverse: Lapped. Obverse: Belted 8. Truncation markedly curved. Fat 4, centered under curl. No eye - cheek crack. Lightly lapped. Reverse: No eagle tongue. Middle leaves droop. Three long, slender arrowheads. Guide lines: D - wing, wing - S. Clashed."